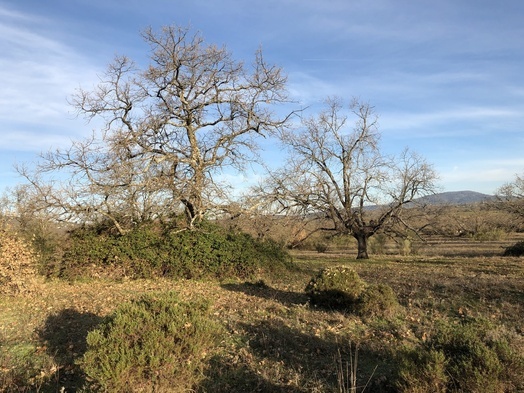 03-Mar-2019 -- This is the third out of four reports reaching confluence points during a bicycle trip from Lisbon to Madrid. The story starts at 40°N 8°W and continues from 40°N 7°W. I spent the night in the town Plasencia – just 8 km from the confluence as the crows fly. After having breakfast in my hotel I found my bicycle gone. I had locked it in front of the hotel with my lock chained to a steel fence. And now it was gone! The waiter who had served me coffee and toastadas just said: your bike has been stolen. But he looked funny, almost like smirking. I didn’t understand the world in this moment. What was going on? But then he showed me my bicycle, which was in the basement of the hotel. What happened was that he found it too risky to keep a bicycle outside for the night – so he somehow managed to open my lock and put the bike inside. I was relieved. The confluence is just 60 m from the road CC-18.2. In order to get the exact zeros I crawled under a cow fence. Luckily the cows were on the other side of the paddock. I found the confluence next to a large tree. As it is beginning of March, it has no leaves yet. After the visit, I continued my trip further east on lonely and remote country roads. Would I be able to reach another confluence point before sunset? Vegetation: oak trees, bushes, grass. The story finishes at 40°N 5°W.